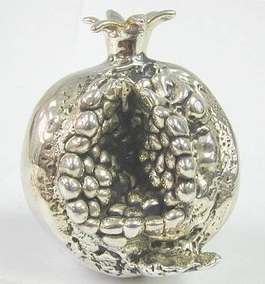 Sterling Silver Model Of A Pomegranate This is a fine highly detailed piece of art made with careful attention to details and high skilled craftsmanship. It was made in the electroforming method. This pomegranate is also a Judaica since it is one of the Seven Species and is a Jewish amulet for fertility. Measurements : Marks : Max width: 3in. / 7.62cm. Height: 3.6in. / 9.14cm. 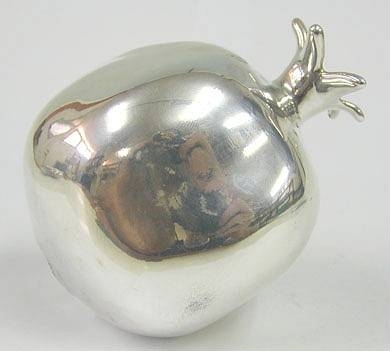 1 inch = 2.54cm 925 for sterling silver, maker´s mark. Weight : 233.7gr. / 7.51oz.